"THE SONGS OF JIMMY McHUGH"
Mention the name Jimmy McHugh to anyone these days and they will probably look at you and say "Who?" Yet he was once one of the most prolific of 20th century popular composers, and much of his work is still heard. He was born in Boston in 1894 it was obvious as he grew he was musically gifted. He received his first piano tuition from his mother, an accomplished amateur pianist, and later attended Staley College where he gained an honours degree. For a time he worked in his father’s plumbing business prior to branching into music . He was first engaged as office boy to the MD of the Boston Opera but was later promoted to repetiteur at the famous theatre. He then won a scholarship for the New England Conservatory but refused it in favour of song-plugging, first at Irving Berlin’s Boston office. He was soon based in New York, and there became a manager with the music-publishing firm of Jack Mills where he was soon composing hit songs for a dozen New York shows. Then in collaboration with Texas-born vocalist and songwriter Gene Austin he was to write his first major hit. The Dorothy Fields and Jimmy McHugh partnership took off after this and between them they produced many hits for many shows. McHugh went on to produce many songs with other partners too. It was January 1925 when Aileen Stanley and Gene Austin recorded "When My Sugar Walks Down The Street" with Nat Shilknet & Orchestra and I think you will like this arrangement. The sound of a bird chirping in the distance is especially memorable, as to are the fine orchestra and this makes this old song as pleasant as it would be if sang today. It wasn’t until March 1930 that Harry Richman with Studio Orchestra recorded "Exactly Like You" from "The International Revue" . Richman has just the right voice for this song . You hear every word clearly as his voice rises and falls expressing how he really feels. He also recorded "On The Sunny Side Of The Street" from the same show, adapted from a Fats Waller song. Again Richman sings it with feeling and warmth and it is tempting to join in. From the film "Cuban Love Song" Lawrence Tibbett with Stewart Wille at the piano recorded the show’s title song in October 1931. Tibbett sings with his usual charm. Tenderly his voice softly rises and falls and I think you will appreciate the even though you might not have heard it before. I loved the next song too. From March 1932 it’s "Good-bye Blues" sung by the Mills Brothers from the film "The Big Broadcast". A lively jolly song this with just about everything to recommend it. The music is good and the Mills Brothers sing at frequent intervals while the guitars play harmoniously with them. Following this from December 1932 we have the Mills brothers again in "Diga Diga Doo" from "Blackbirds of 1938" with Duke Ellington, no less, on piano with and his orchestra . In spite of the strange title I loved this. The arrangement is clever and full of different sounds from the various instruments. An entirely different number next. This is the familiar "Don’t Blame Me" from the film "Dinner At Eight" recorded in 1933 by Ethel Waters with the Dorsey Brothers Orchestra. I like Ethel Waters’s voice. She has the ability to sing from the heart if it happens to be a sentimental song, which this is. You sense here that she is really pleading with someone not to blame her. An excellent number to follow is Connie Boswell singing "Lost In a Fog" with Jimmy Grier & Orchestra recorded in October 1934 from the film "Have a Heart". Connie sings the song without any effort and it sounds good as she makes sure you know she really is lost in a fog. I like her voice as she is clear and always sounds sweet. Many of the singers on this disc are unknown to me but most are pleasant to listen to. One I enjoyed very much sings "I feel A Song Coming On" from the film "Every night at eight", recorded in July 1935 by Frances Langford. Like many of the singers of that time she sings tunefully and well, without actually being outstanding. A straightforward performance with no embellishments and none the worse for that. To follow we have "Lovely Lady" with Carson Robison singing and whistling in January 1936. This has a gentle swing to it and Carson Robison sings it in such a way you feel you want to stand up and dance. The whistling at the end makes this recording, together with the right tempo of the orchestra, a really enjoyable one to listen to. From the film "King of Burlesque" we have "I’m Shooting High". This was recorded in London April 1936 with Carolyn Marsh accompanied by Carroll Gibbons and his orchestra . I doubt if anyone could dislike this number. Carolyn sings with great feeling and has an attractive, husky voice which she lowers slightly when coming to the verse when she partially sings and speaks the words of the story. From the film "Top Of The Town" Mildred Bailey recorded "Where Are You?" in Chicago in January 1937. Not a particularly good number. To me it lacks depth and warmth, at least it does sung like this. I think Bailey sounds off-key at times and Roy Eldridge’s trumpet doesn’t help. So this number is not for me. What a difference when we listen to the next recording. From "Blackbirds of 1928" we have Billie Holliday in "I Must Have That Man". She has that low, drawling way of singing that is so distinctive and with Teddy Wilson at the piano it is a joy to listen to. In London in January 1937 from the film "Banjo On My Knee" Marjorie Stedeford made "Where The Lazy River Goes By" . I found this really entertaining. You can hear each instrument individually playing a few bars while the others play in the background and it’s wonderful to hear how they never appear to clash. Marjorie Stedeford, with her naturally pitched low voice, blends in perfectly just at the right time and continues to the end. A very different recording was made in London in February 938 when Al Bowlly and Ronnie Munro and his orchestra made "You’re A Sweetheart" . Al Bowlly, as usual, sings in that easy way that came so naturally to him . A favourite of mine because he is so easy to listen to, and he doesn’t disappoint with this. Another recording of Al Bowlly’s to be enjoyed here is "I love to Whistle" from the film "Mad about Music" and recorded in New York March 1938, with Fats Waller. A comedy number, excellently done. Fats Waller has that gift of putting over any kind of song and in this he really proves it. He partially sings, talks and whistles through this really delightful number. To follow this we have another recording with Fats Waller accompanying Adelaide Hall in "I Can’t Give You Anything But Love" recorded in London in August 1938. As Adelaide sings this familiar song you hear Fats Waller interjecting in the background as he plays the organ. From the film "Every Night At Eight" Frances Langford is back for "I’m In The Mood For Love" recorded in 1939. A lovely song sung with great feeling. Who can ever forget Carmen Miranda in "South American Way" from the show ‘ The Streets Of Paris?". The music is exactly right as Carmen sings in that sensuous way only she can, and you even feel yourself swaying away with her . When she pauses you hear more of the twangy type music combined with a superb choir. A great good recording. To follow this we have a recording made in New York in 1940, "Say It Over Again" from a film called ‘Buck Benny Rides Again’ with Ray Eberle and Glenn Miller and his orchestra. To me this record really belongs to Glenn Miller. In London in July 1943 Anne Shelton with Ambrose and his orchestra recorded "Coming In On A Wing And A Prayer". A very familiar and popular wartime favourite with the band here playing a long introduction, during which you hear the effect of a plane coming over before Anne sings. Two of the greatest singers to finish. From the film "Higher And Higher" we have Frank Sinatra with the Bobby Tucker singers in New York in November 1943 with "A Lovely Way To Spend An Evening" . Sinatra is not really a favourite of mine but this is a good recording and the singers in the background help to make it so. At the same time Sinatra with the same singers made "I couldn’t sleep a wink last night". I liked here how the singers came in and harmonised with Sinatra as the number proceeded. Frank sings with great feeling making the whole recording well worth listening to. Finally we have ‘The Old Groaner", Bing Crosby, with Carmen Cavallara at the piano singing "I Can’t Believe That You’re In Love With Me" from "Birds of 1926" made in 1945. As always when Bing sings you sense he means every word, and over the years his voice has never changed from that special way of his. 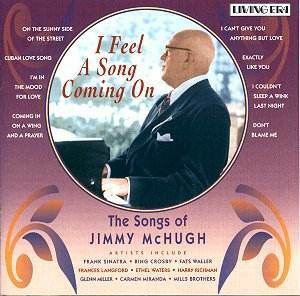 What a songwriter Jimmy McHugh was and I recommend this disc with enthusiasm to bring back so many memories. The transfers are up the usual Living Era high standard.